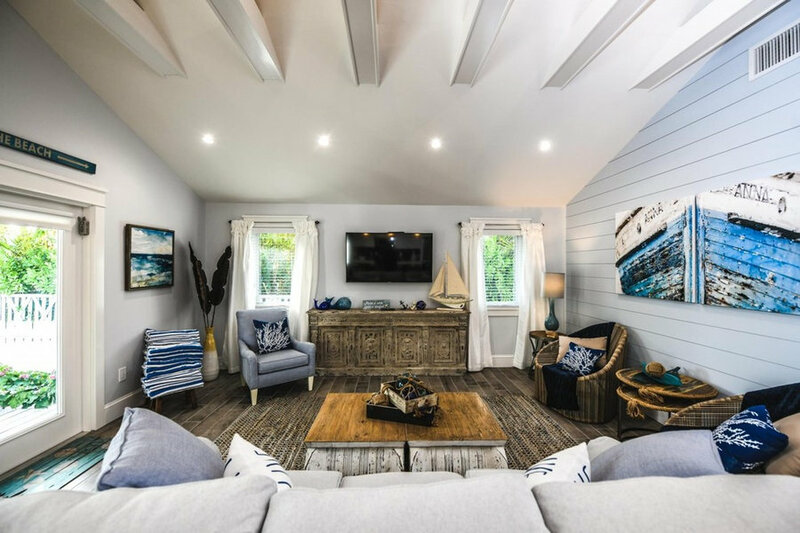 Elegant coastal living inspired by organic and cozy-feel furniture. 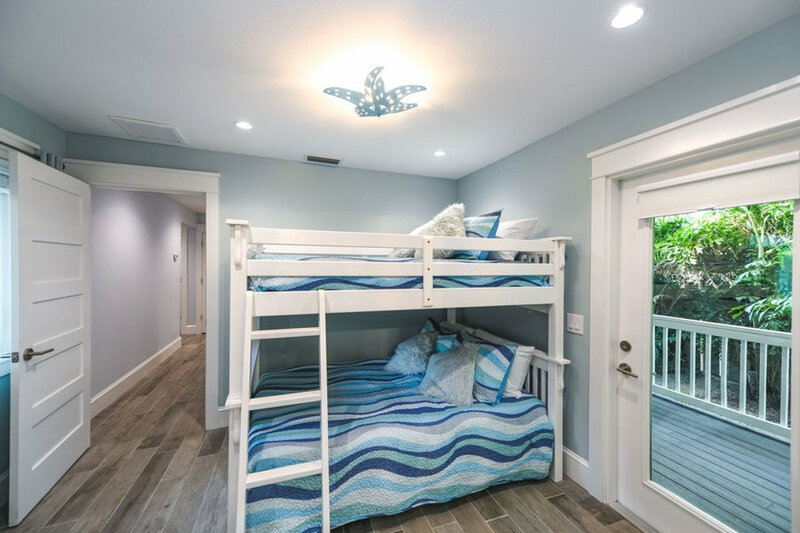 Colors of blue, white, and warm wood enhanced with rope accent and hand blown glass invite you to curl up and stay in. 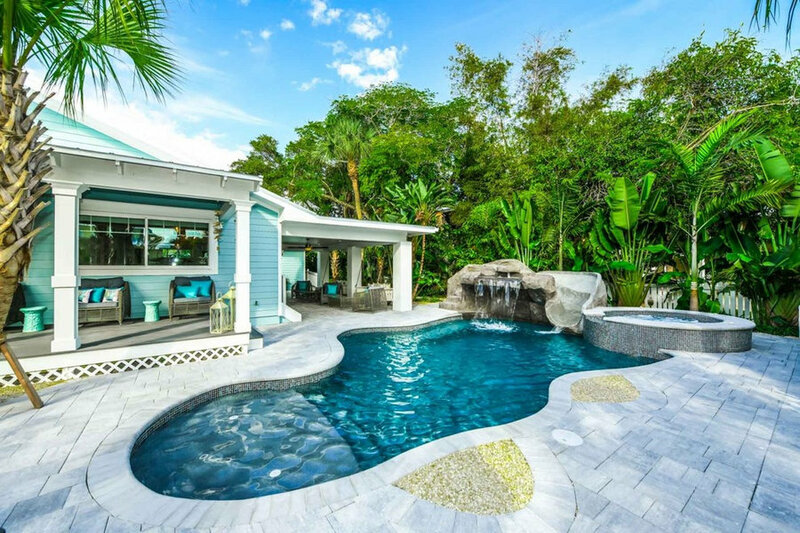 Pool, spa, grotto, waterfall and pool slide create the perfect oasis for outdoor fun and play. 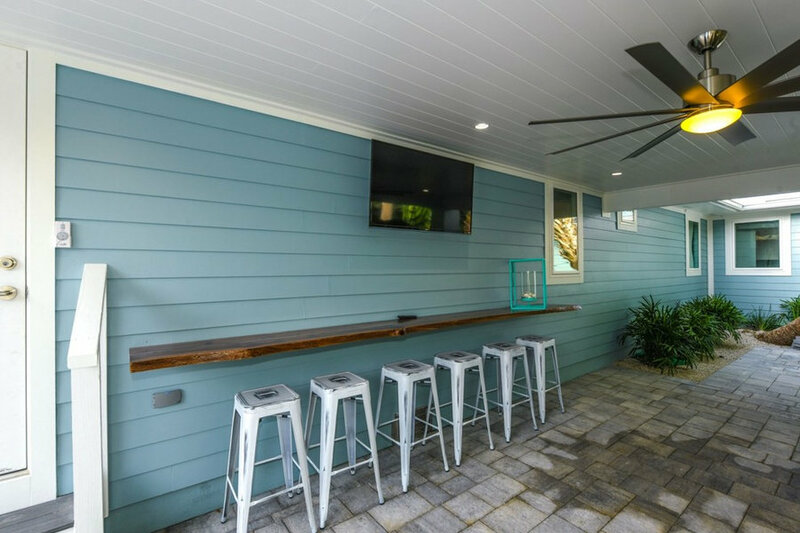 Side patio includes a floating bar and TV. 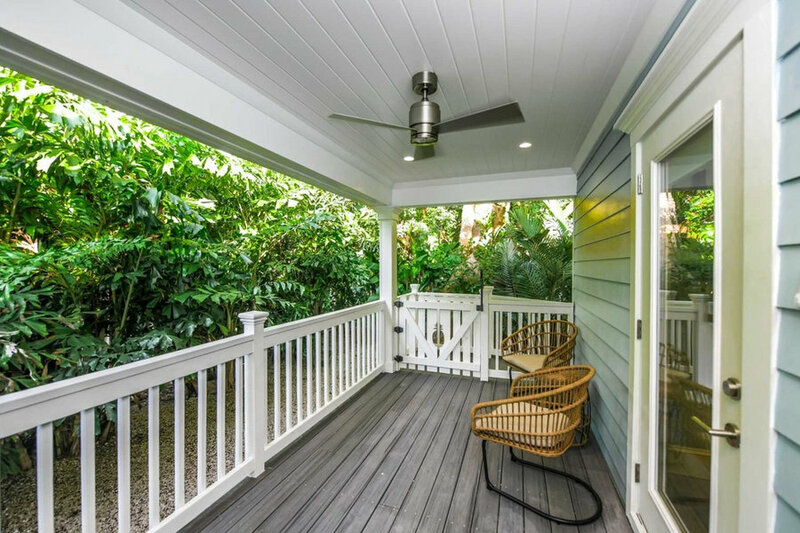 Front porch includes plenty of seating. 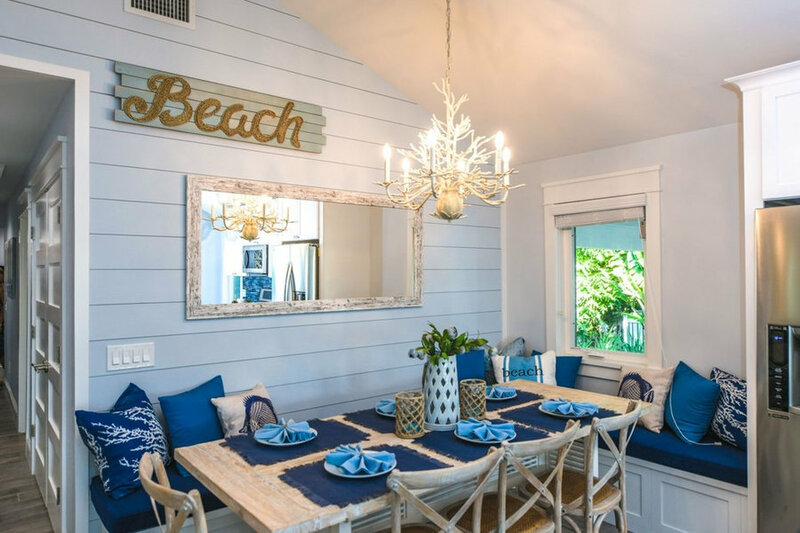 Cool coastal colors of turquoise and white bring the sense of true coastal retreat. 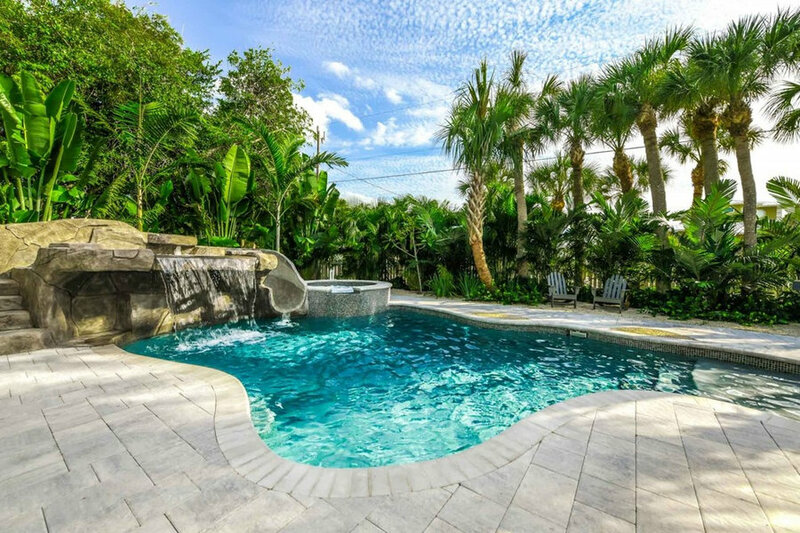 Pool, spa, grotto, waterfall and pool slide create the perfect oasis for outdoor fun and play. 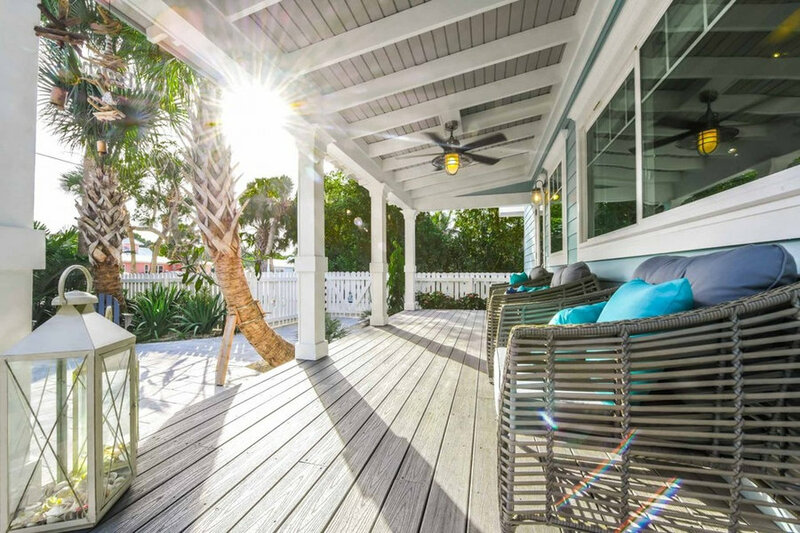 Front porches are made for sharing memories. 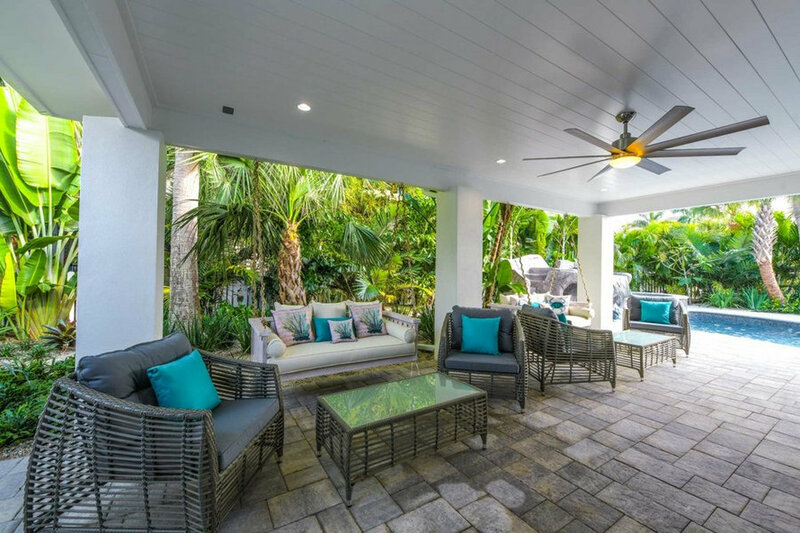 Wicker seating with bright turquoise pillows invite you to sit, relax and unwind with friends and family. 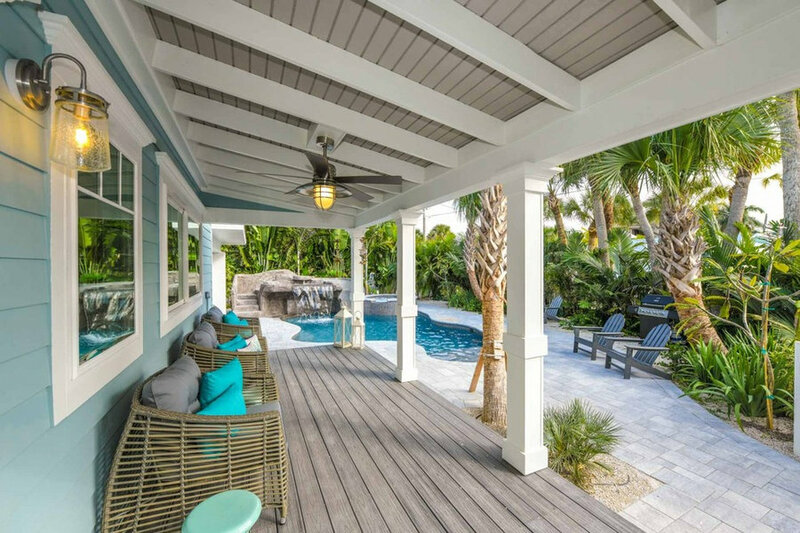 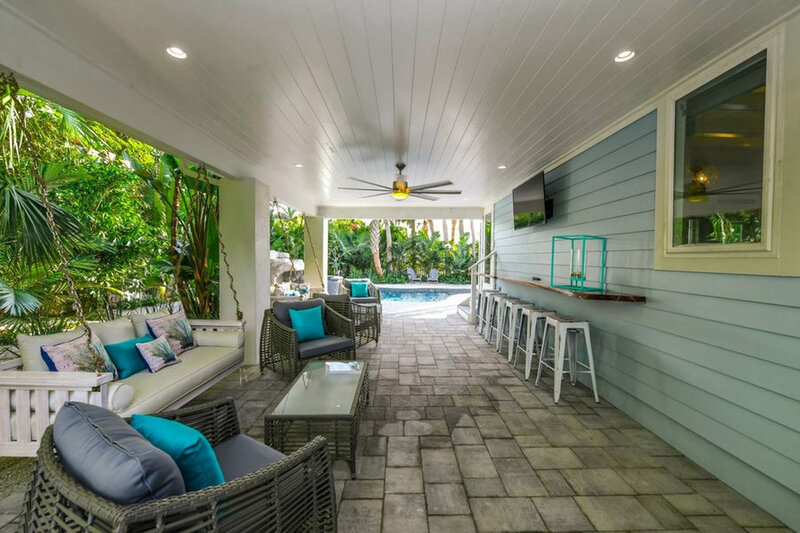 Hanging benches, wicker lounge chairs, floating bar, and plenty of seating creates the perfect outdoor entertaining space. 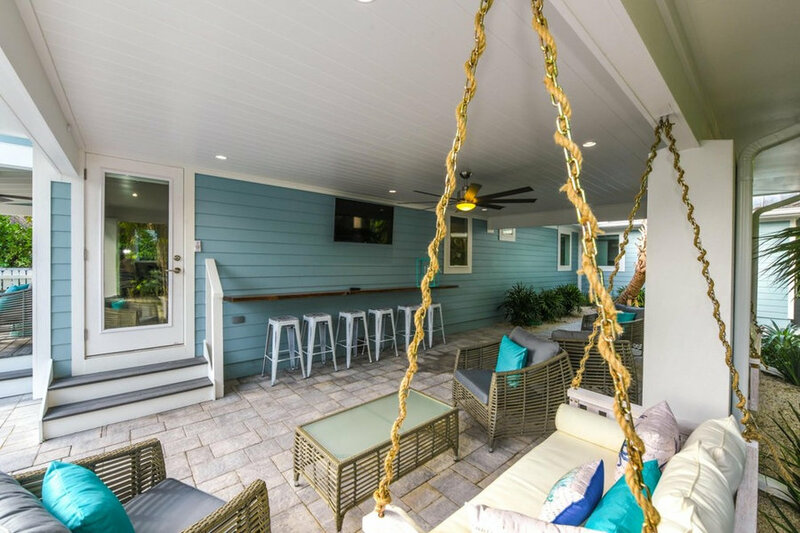 Hanging benches, wicker lounge chairs, floating bar, and plenty of seating creates the perfect outdoor entertaining space. 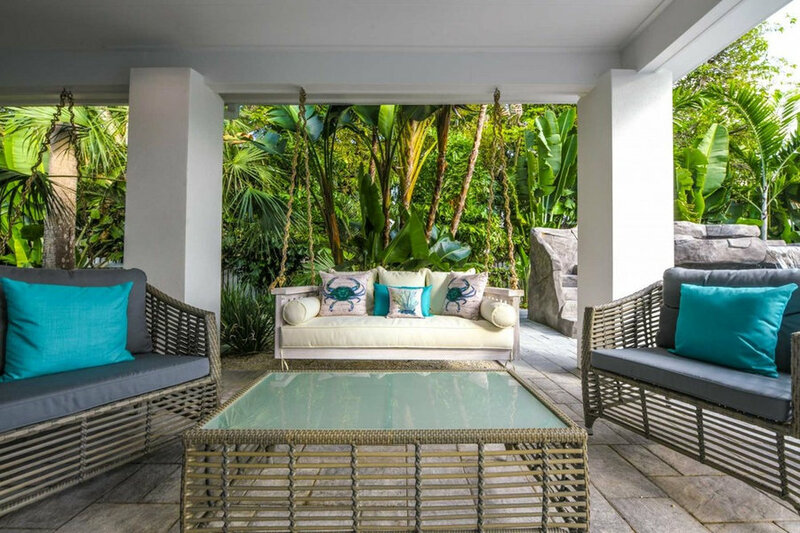 Rope wrapped around chain on the hanging bench ties in the coastal design. 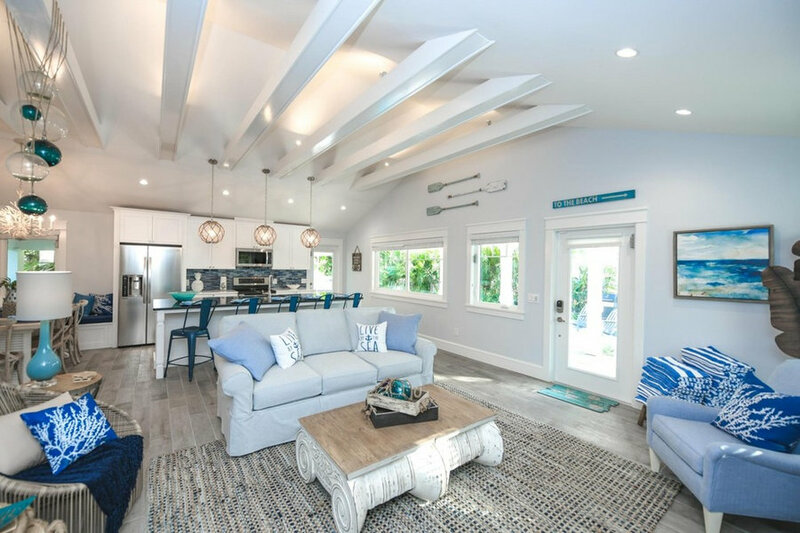 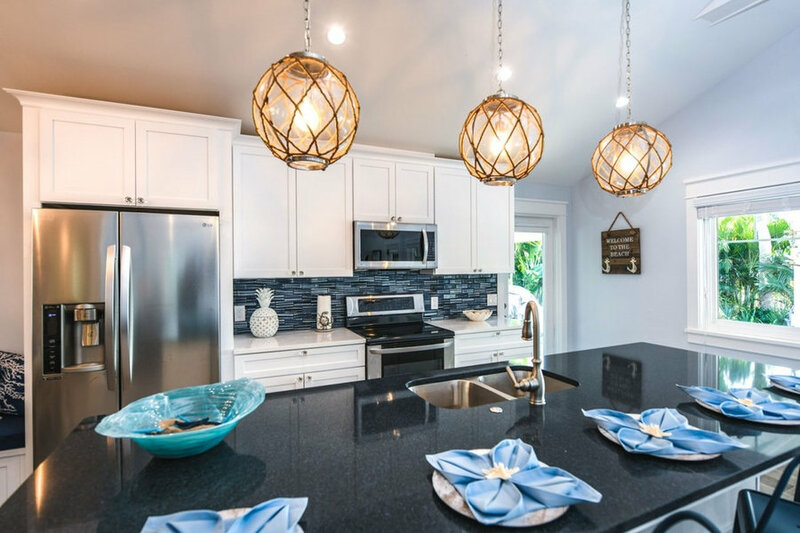 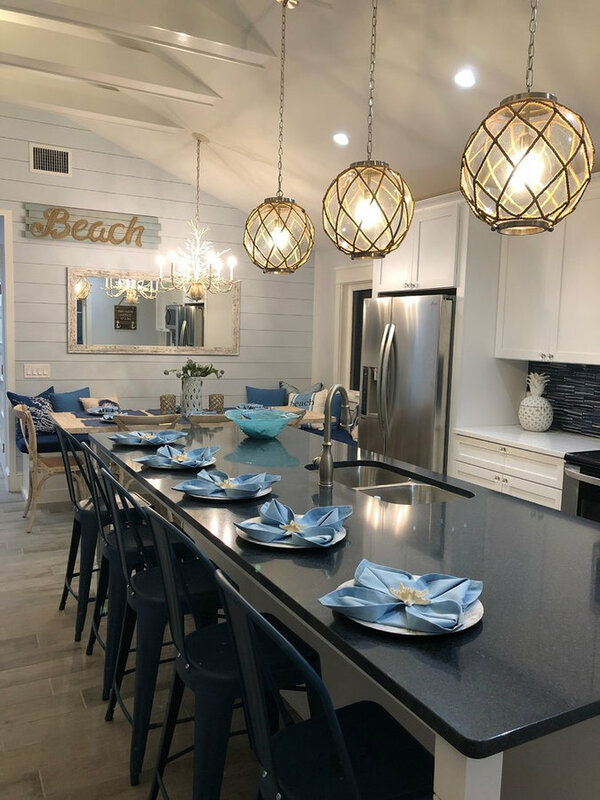 Coastal kitchen with island and dining table nook is enhanced with blue metal bar stools, globe and rope pendant lights, and rustic dining table and chairs. 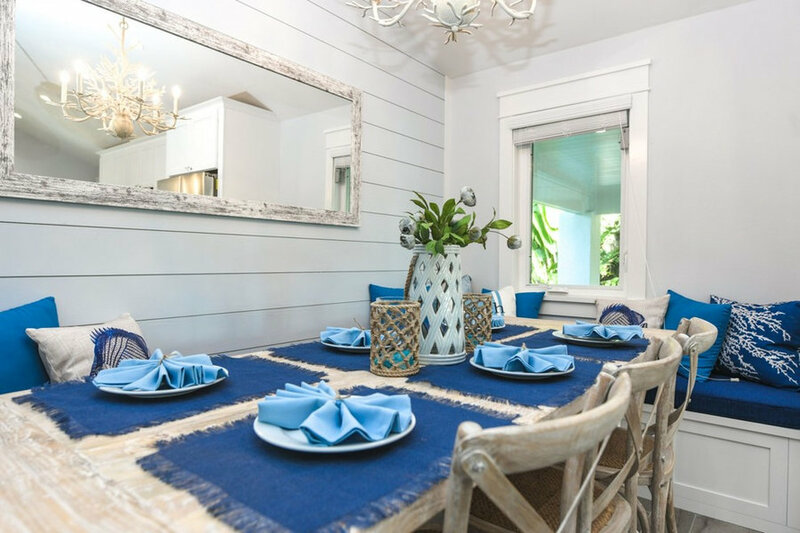 Coastal design inspires a cozy dining nook with built in banquet, plank wood siding, and weathered dining table, complete with table settings in blue and natural rope decor. 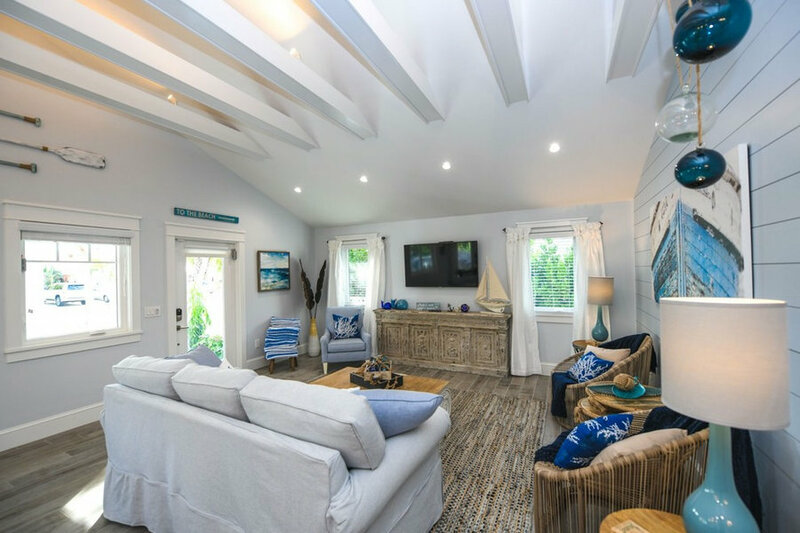 Elegant coastal living inspired by organic and cozy-feel furniture. 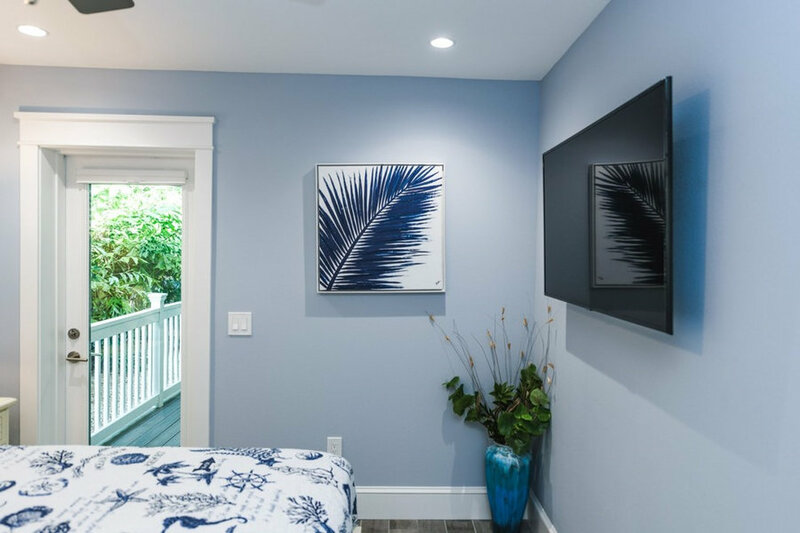 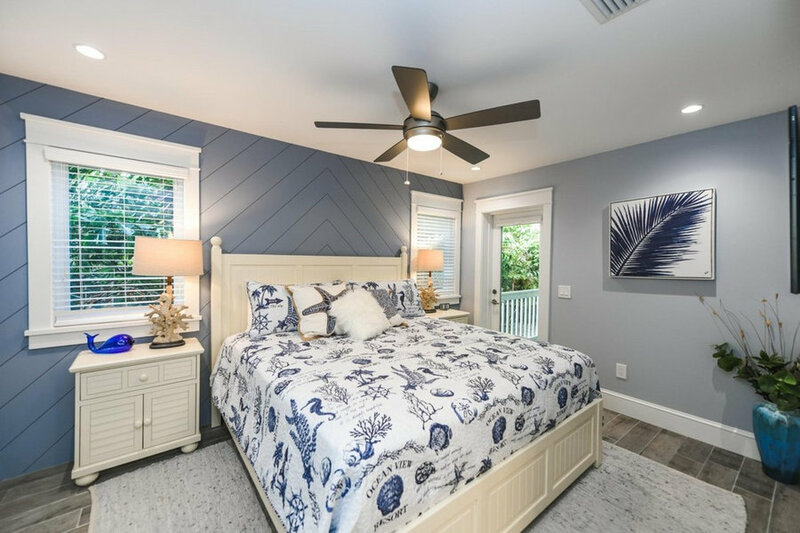 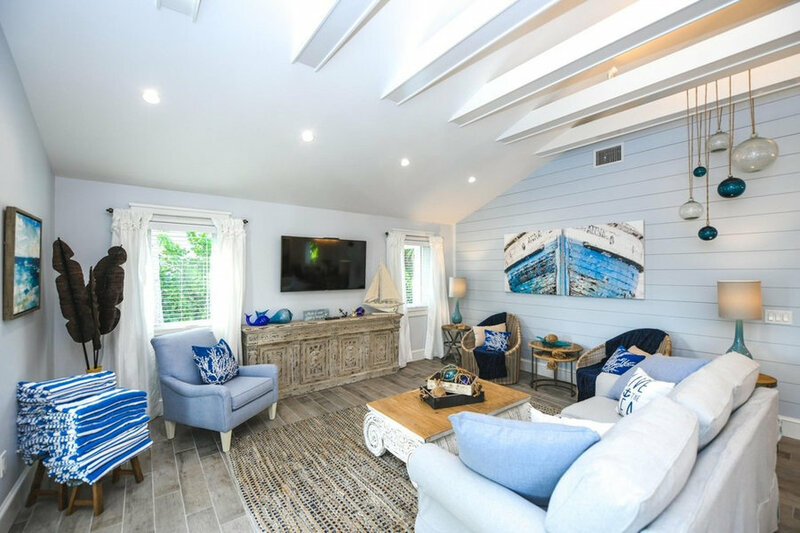 Colors of blue, white, and warm wood with a theme of coral, ship bows, and hand blown glass globes invite you to curl up and stay in. 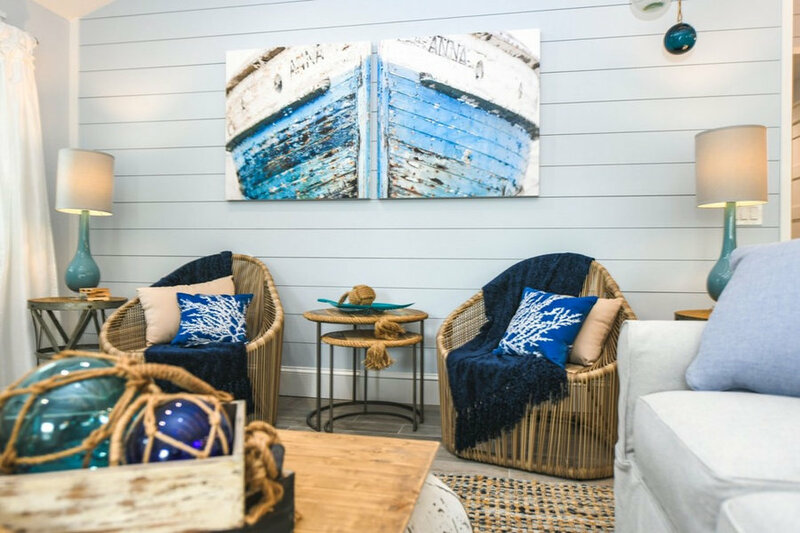 Elegant coastal living inspired by organic and cozy-feel furniture. 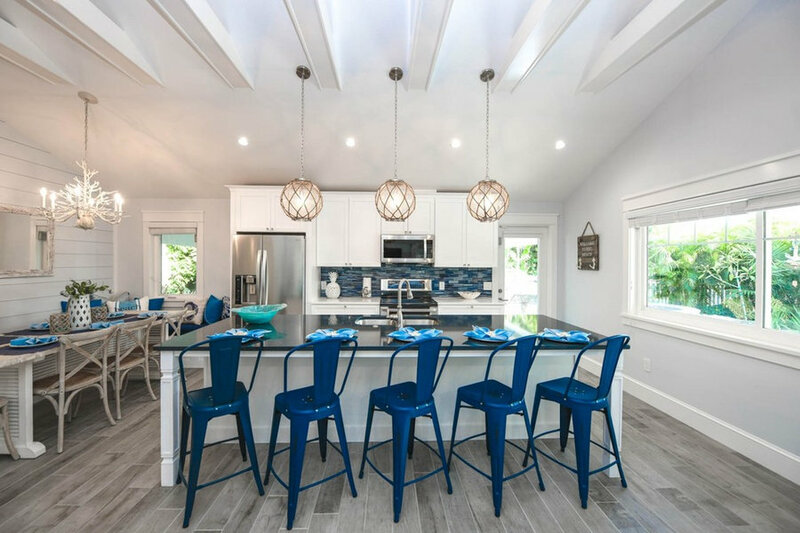 Open kitchen and living room, blues and whites flow across the room creating continuity and breezy warmth. 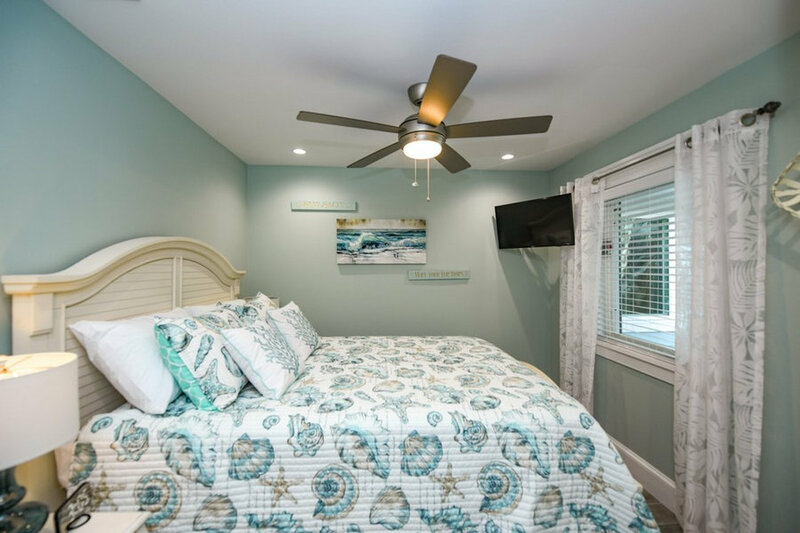 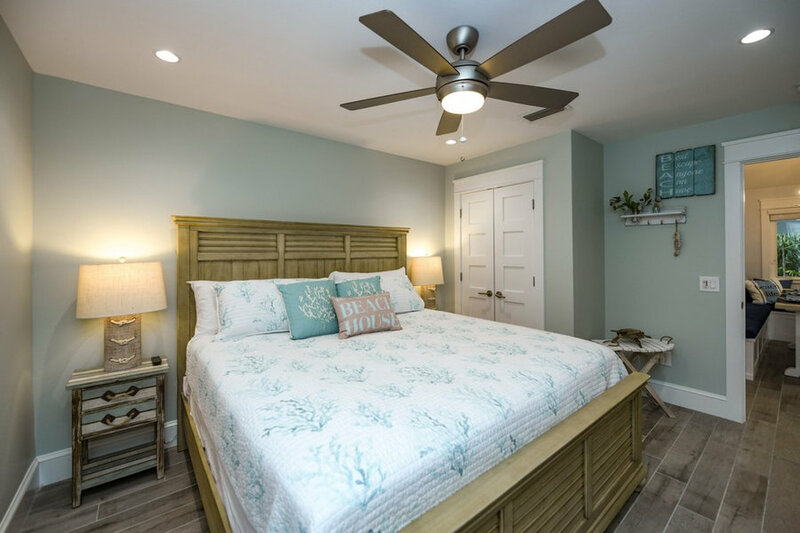 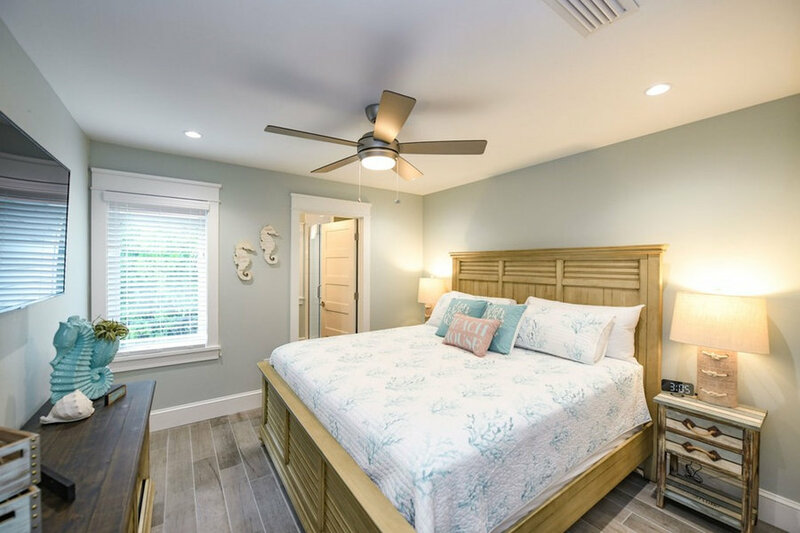 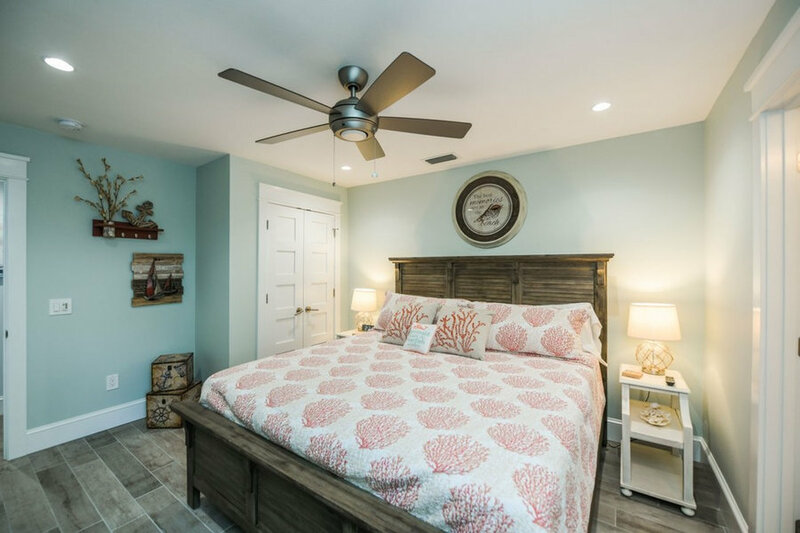 Coastal decor and soft colors invite you to relax and unwind. 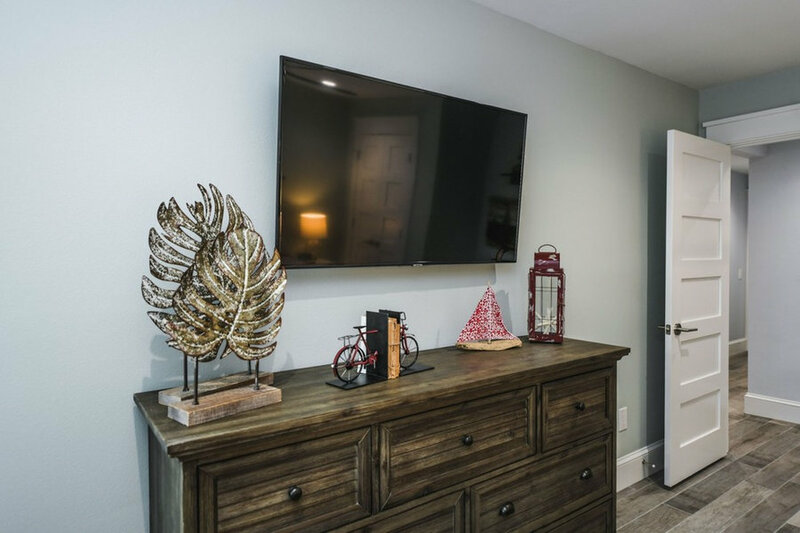 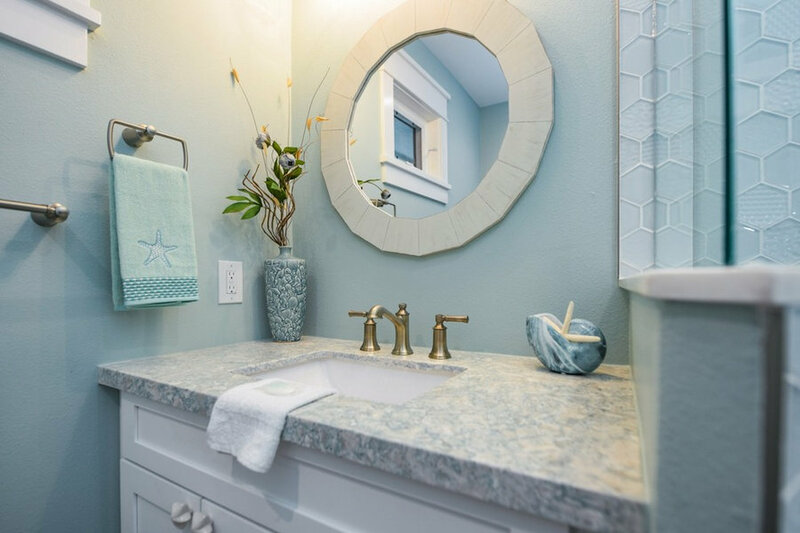 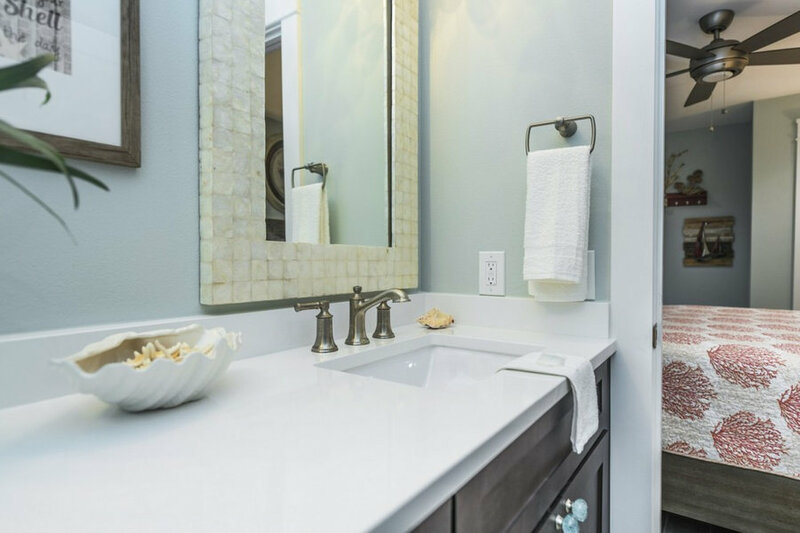 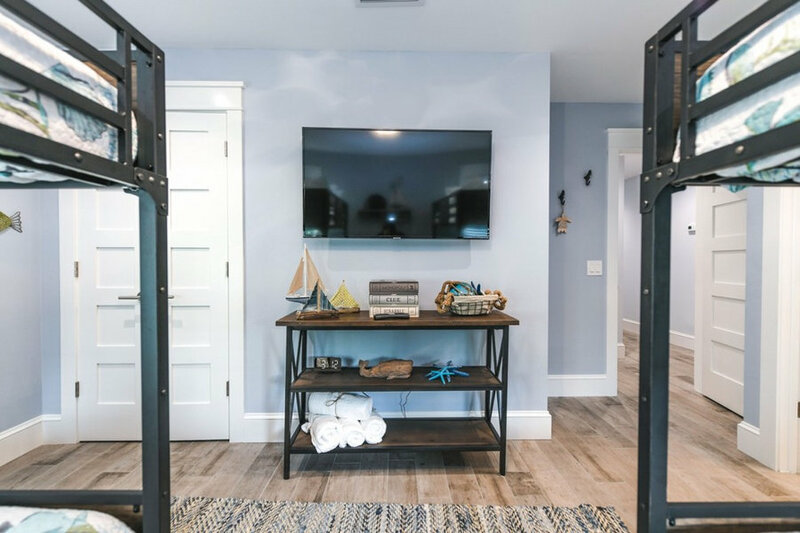 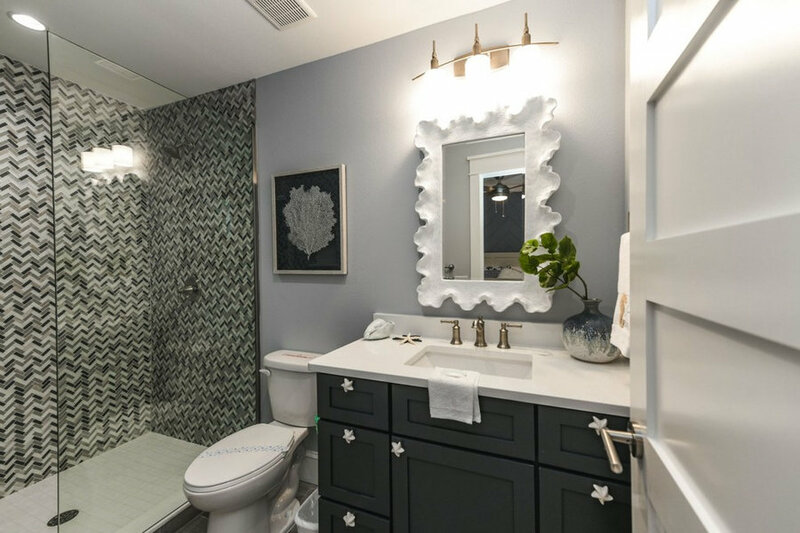 Glass mosaic mirrors, capiz shell lighting, turquoise coral decor and starfish cabinet knobs create soothing coastal vibes. 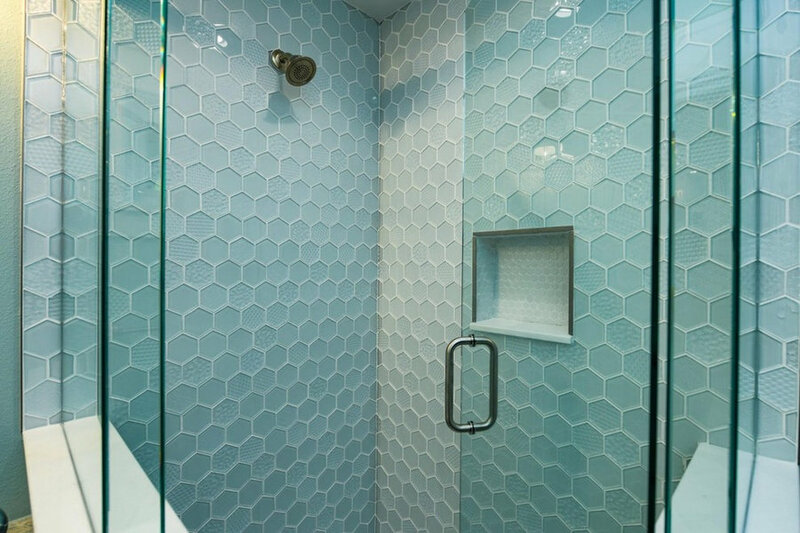 White hexagon glass tile creates a spa-like shower. 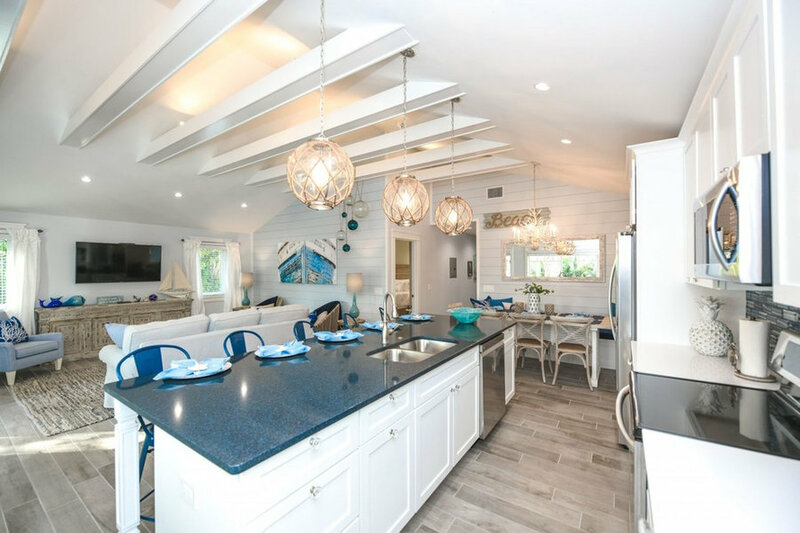 Quartz counter in soft greens and whites add to the coastal style, finished off with white shaker cabinets and white starfish cabinet knobs. 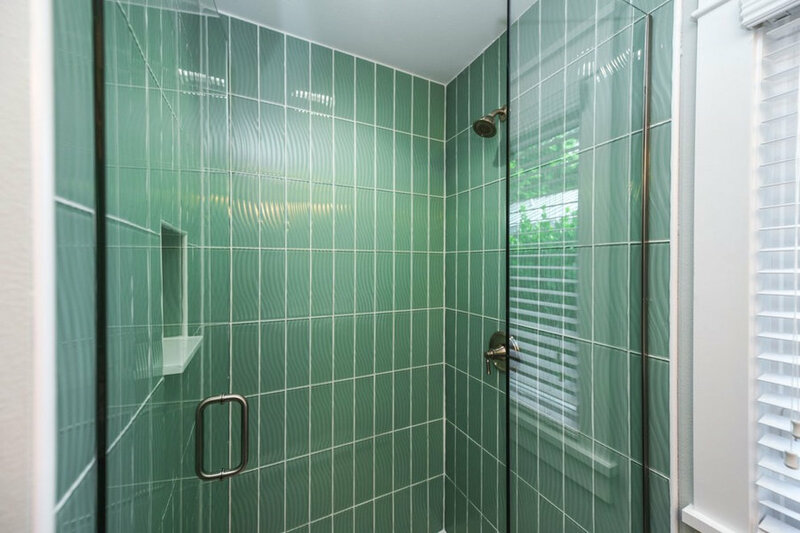 Aqua glass tile creates a spa-like shower. 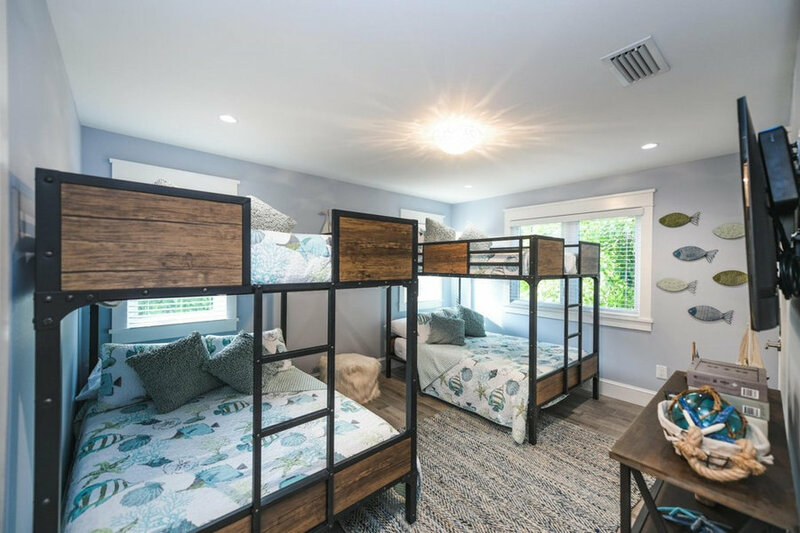 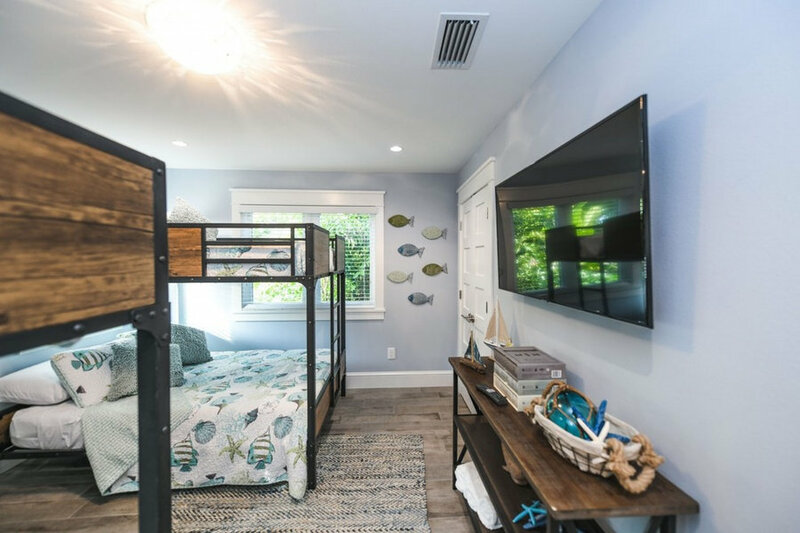 bunk beds with wood and iron are softened with turquoise and green coastal bedding, finished off with green and blue fish decor. 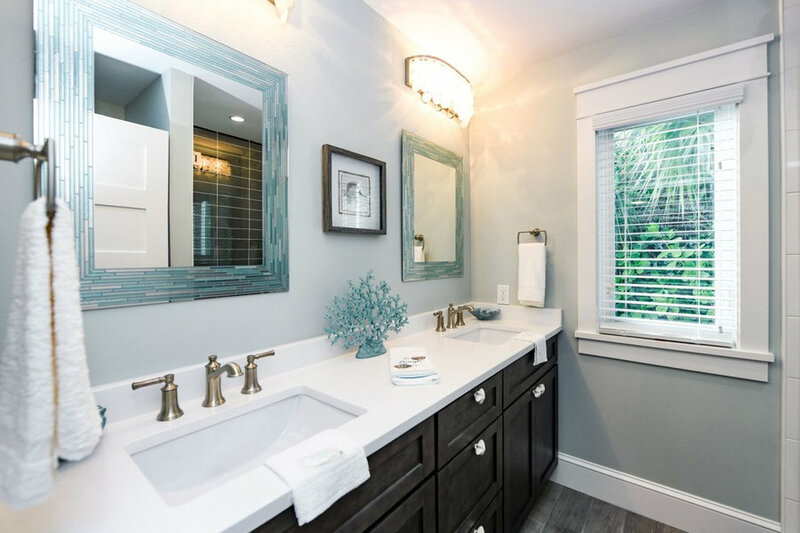 Capiz shell mirrors, clam shell decor, and aqua glass cabinet knobs. 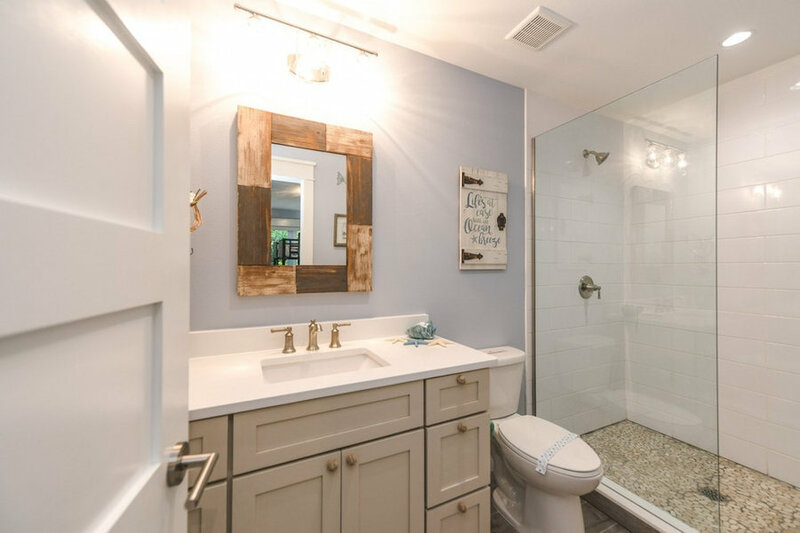 This coastal bath is complete with barn wood mirror and rope knot cabinet knobs. 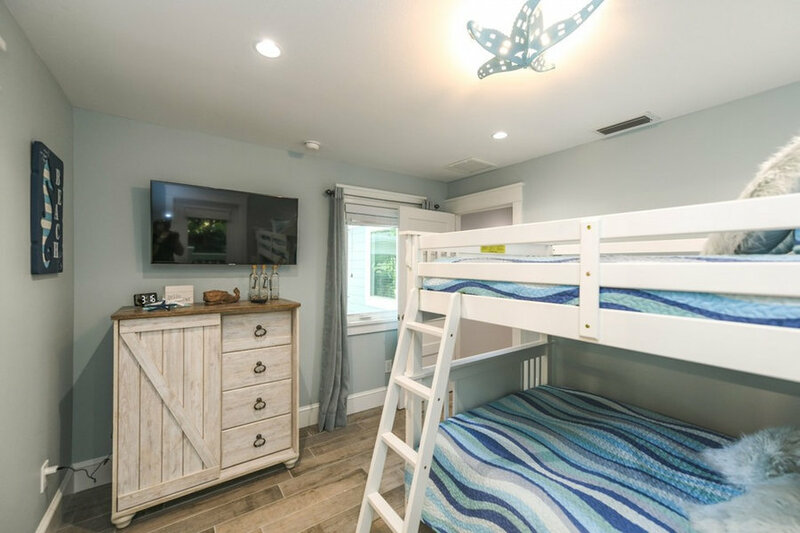 Bunk bed with starfish light fixture and fun coastal wave design bedding. 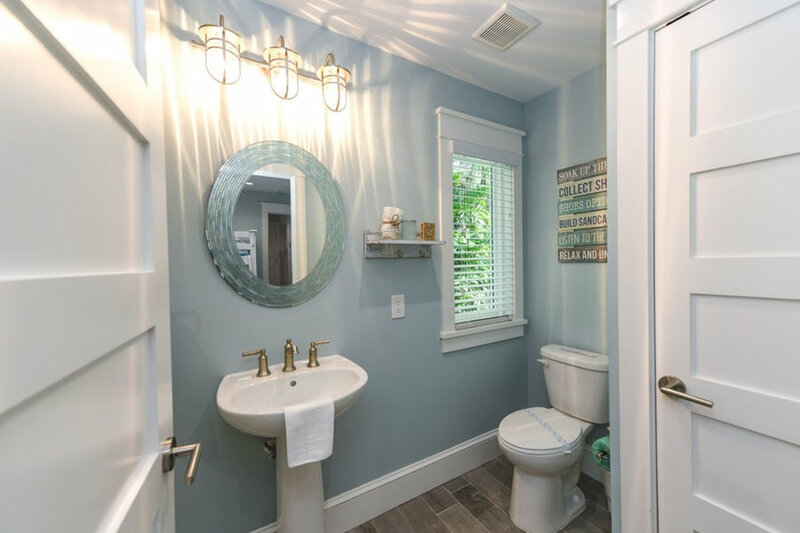 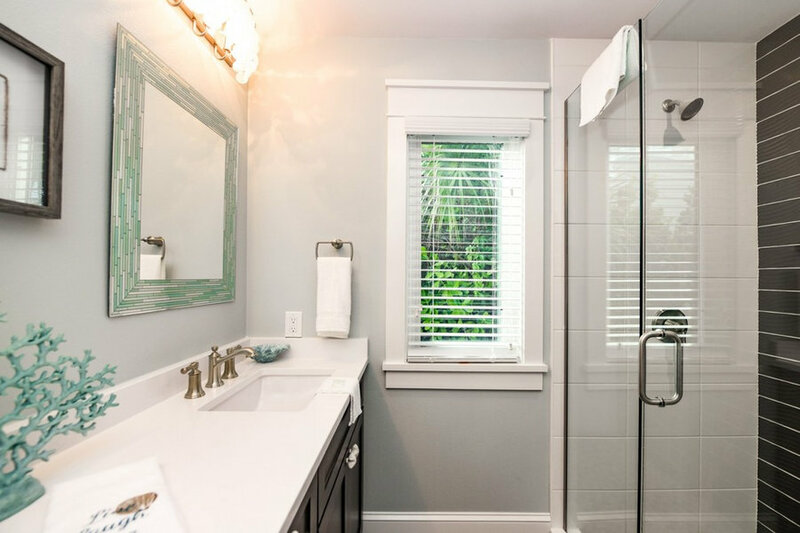 This coastal bath is complete with oval mosaic glass mirror and nautical vanity light.